* Deluxe limited edition hard cover book with music (exclusive digital downloadable record). Culled from over 60 articles, drummer/composer/visual artist Billy Martin (Medeski Martin & Wood, The Lounge Lizards) takes us on a journey into the processes, concepts, successes, and failures â€“ as a teacher, musician, and a human being. Martin is not only talking to other musicians, but to anyone who tries to approach the world with wonder, curiosity, and care. Includes over 30 improvised drawings and illustrations spanning 3 decades. 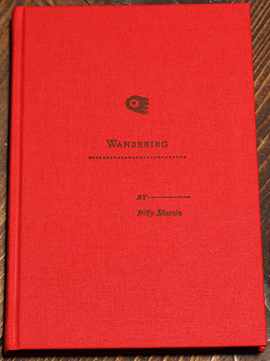 Wandering Music includes new original music by BIlly Martin written for strings, percussion, brass, electronics and more. The 'graphic score series' use drawings from the Wandering book that informs solo interpretations by music masters Cyro Baptista, Nels Cline, Anthony Coleman, David Fiuczynski, Bill Frisell, Annie Gosfield, Billy Martin, Rakalam Bob Moses, and Marcus Rojas. 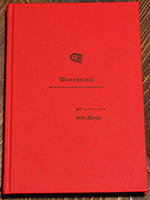 Book with digital download / companion record $55.